Bethlehem Township was settled by Europeans as early as 1730. It became a part of Bucks County in 1737, the year of the famous Walking Purchase. The Township of Bethlehem came into existence in 1746. At that time, it was a political division of Bucks County, Pa. It got its name from the village of Bethlehem, which at that time was within the Township boundaries. The name "Bethlehem" was originally chosen by the German Moravian Brethren on Christmas Eve, 1741.
by calcining limestone and is dated from the late 1700's - early 1800's. On March 10, 1746, thirteen spirited residents petitioned the Bucks County Court for the formation of the Township. The petition was accepted in Newtown. 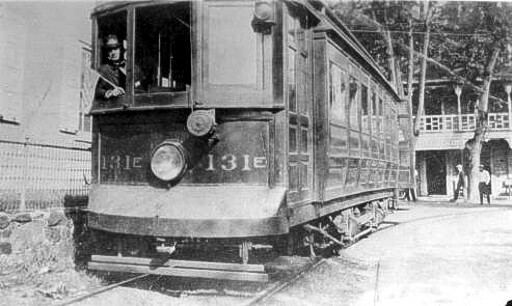 The Township had within its area Upper and Lower Nazareth Townships, and the Boroughs of Bethlehem and Freemansburg. It included the Lehigh River, Monocacy Creek and several small streams; among these was the "Nancy's Run" or Nancy Run Creek. This Creek was named for an old woman named Nancy who worked as a fortune teller and became quite famous in the neighboring regions. She lived in a small log cabin half a mile up the creek from its mouth where Willow Park road crosses. The population of Bethlehem Township in 1780 was 1,375. Territorial increase in population is usually the result of industrial expansion. Such was the case in Bethlehem Township when in 1806 George Butz built a grist mill along the Nancy Run. Soon after, a group of dwellings sprang up and the area became known as Butztown. The mill was later owned by R.T. Schweitzer who tore it down and rebuilt it within the old walls. Today the Keystone Pub (formerly the Butztown Hotel) stands on that site. A Local Townsman poses in front of the Butztown Hotel (circa 1910). Through the years, Bethlehem Township was not without trouble with the Native Americans. Among the original pioneer families of the Township were families by the names of Cleyder, Buss, Kocher, Bunstein, Hartzel, Hanshue and Ritter. They settled on farms between Hecktown and Farmersville. On one occasion a settler was captured by Indians. According to a prearranged plan, he dropped broken twigs along the path and his friends were able to follow him; thereby rescuing him at night. Later, one of the Cleyders was murdured by an Indian and one of the brothers spent the rest of his life hunting and killing Indians to avenge his brother's death. 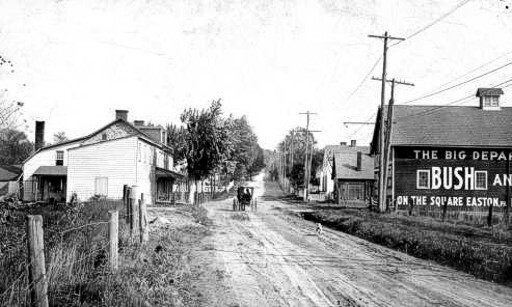 stood on Easton Avenue (circa 1912). In 1776, land in the Township was bought at .27 cents per acre. Industry, mostly milling and later a paint factory (Blue Mt. Paint Mills), grew in the Township until the time of the Civil War. By this time the size of Bethlehem was much the same as it is today, having lost part to Nazareth in 1780 and more in 1807. The Borough of Bethlehem was lost in 1845 and Freemansburg in 1856. Real estate and taxes increased in the Township in the mid 1800's along with growth. By 1870, the population was 2,230. Between 1910 and 1930, a wave of immigration spurred an increase in population. "Miller Heights" was started in the 1920's from an old Township farm. In November 1929, the stock market crashed and the national economy slumped. For residents of the Township, depression was the same as it was over the whole country. Then in 1941, World War 2 began. All able-bodied men of the Township went to serve their country. In 1945 they returned home. From about 1945 to 1954, an excess of what historians called "war babies" assured a steady increase in the Township's population. Throughout the 1950's the Township experienced substantial construction and expanded significantly. 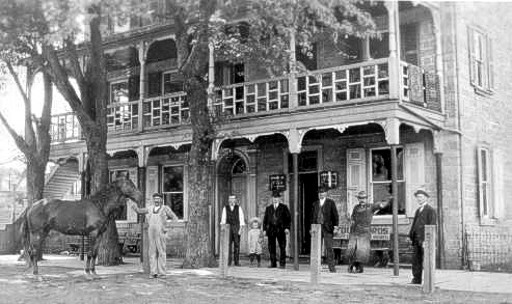 On January 1st, 1963, Bethlehem Township was incorporated as a First Class Township of Northampton County, Pa.
in front of the Butztown Hotel(circa 1910). Below are some videos of Willow Park. This 20-acre park closed in 1969 after 38 years in operation. Willow Park was a small park that served as a community hangout. One of the most popular attractions at the park was the swimming pool. Willow Park actually opened in 1931, at the height of the Great Depression. The park also had a carousel, some kids rides, an arcade, and a Schiff Wild Mouse.